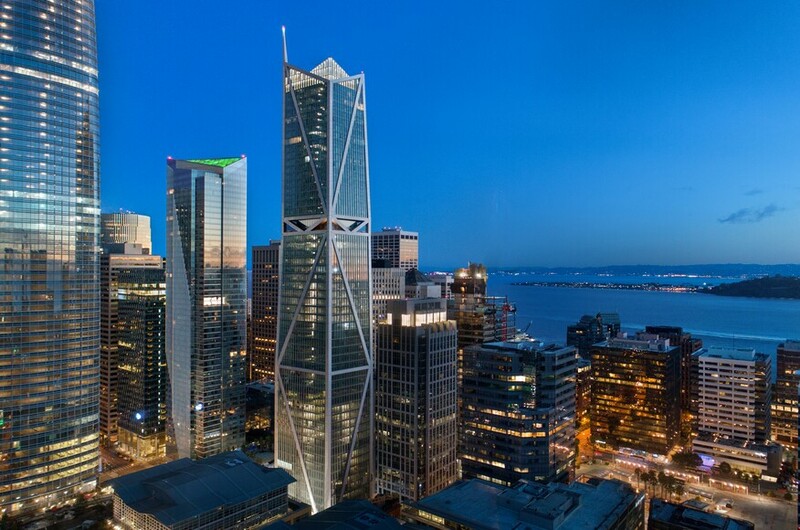 Transforming the San Francisco skyline, 181 Fremont is at the forefront of modern architecture – the newly completed tower, soaring over 800 feet into the sky, was designed by Heller Manus Architects, developed by Jay Paul Company and engineered by ARUP. The building is one of the tallest mixed-use high-rises on the West Coast and serves as the centerpiece of the new downtown. Its premier location is adjacent to the Salesforce Transit Terminal, slated to open next month. The building features a state-of-the-art exoskeleton designed in a saw tooth pattern, with a magnificent spire that ascends from its crown. The aluminum exoskeleton structure breaks the planes of 181 Fremont’s façade, effectively tilting the glass in distinctive ways. Combining beauty with function, the building’s saw-tooth glass structure also serves as a passive solar design feature. By angling the mullions slightly in against one another, an additional amount of shade is afforded throughout the day as the sun passes over the glass. Wind played a large role in developing the shape of 181 Fremont. The reverse chevron halfway up the façade made from the supporting steel beams aims to significantly reduce the wind forces on the building and the pedestrians walking below at street level. The chevron structure was also inverted to maximize the views out to the city, bay, and beyond. 181 Fremont is the only residential tower to be pre-certified LEED Platinum in San Francisco, and every finish and material throughout the building was evaluated to meet – and often exceed -CALGreen requirements. Anchored by the deepest construction shafts of any residential tower ever drilled in San Francisco, the building measures over 260 feet into the bedrock. One of the most seismically sound structures around, 181 Fremont has been designated one of the most resilient buildings in the country; it can withstand the impact of a 475-year seismic event (roughly a M7.5-M8.0 earthquake on the San Andreas Fault) with minimal disruption. Designed to make a permanent impression on the city of San Francisco, 181 Fremont’s design is an expression of world-class modernism, sustainability, and neighborhood integration – transforming the surrounding neighborhood and redefining an era.